Most people are in their own world when in an airport and in life in general, which makes it easy to miss opportunities that can leave a meaningful imprint in the present surroundings. On a recent trip, I was seated next to a gentleman who was gracious enough to introduce himself and exchange a few kind words before we took off. I must admit I was surprised since I’m used to only hearing complaining passengers and the boisterous voice of the flight attendants over the intercom directing my attention to their safety presentation. But, I appreciated this guy’s conversation, because it meant that he was wise enough to not take life too seriously and capable of setting himself aside to acknowledge the worth of those he encountered along the way. That was light in the middle of my extra long day of flight delays, gate changes, and overpriced sky snacks. The best part about it all was that I had the opportunity to return the kindness. As we reached our cruising altitude among the cumulus clouds, I saw that he was reading notes printed in incredibly small text. I was engaged in the same enriching activity so I was using my overhead light. Earlier I noticed he had reached up to turn his on as well, so I assumed the shining light on our row was from both lights. After a few minutes of reading, something told me to look up, which is when I saw that the light above was only coming from my side. He had been reading for probably about an hour trying to share my light! Part of me felt badly because I hadn’t noticed sooner and couldn’t do anything to save this guy’s pupils, but all I had was now to make up for it and let him know that I did indeed care that his light had blown out. I proceeded to readjust my light so that it was shining directly on his manuscript. He smiled and expressed his gratitude, and we both continued our in flight activities, which by that time mine had switched to sleeping for me. Although sharing my light was a small act of kindness for someone I’d probably never see again, I knew it was the right thing to do. It was also a good lesson. We should all be mindful of those opportunities we have to brighten someone’s outlook. So, whether it’s to help someone see what they’re reading or maybe see where they’ve gotten off the path, be the one who illuminates this fast-paced, and sometimes brash world with your light of tenderness, joy, and thoughtfulness. Seat backs and tray tables up. We’re ready for takeoff toward another week of an amazing journey! Who would have thought I’d find a little nugget of wisdom in a kitchen gadget? I swear wisdom is all around you if you’re awake and conscious of every day moments. Last week I elaborated on what it meant for me to be whole and shared a few of my cooking creations in my attempt to get better acquainted with my dinner table. And this week as I thought about how I would maintain my chopping and sautéing momentum, I remembered the one gadget that would take my marinade to the next level! It’s one of the easiest to manipulate and clean. It also aids in producing a smell so incredibly crisp and fresh that’s to die for. Ok, please don’t die. My friends, ask yourself if you have a lemon zester! If you don’t, Homegoods will be expecting you. 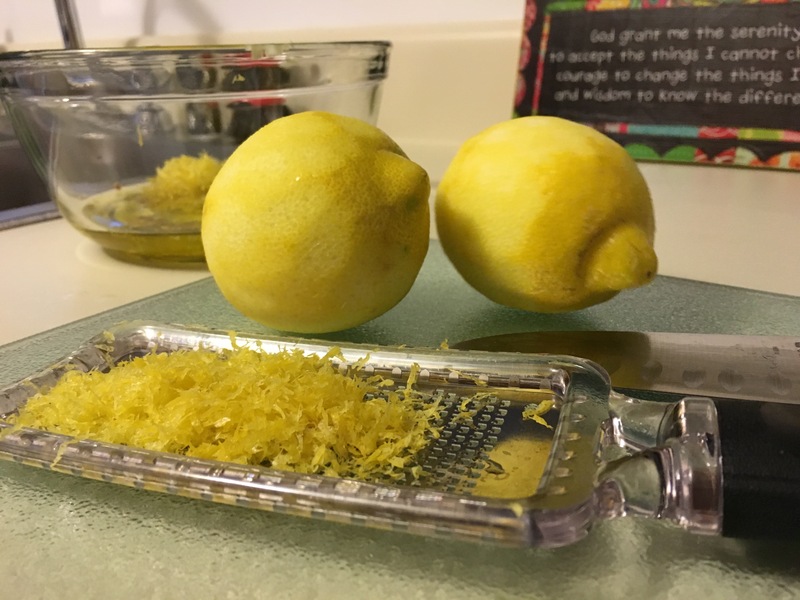 I honestly think they named it a lemon zester not just because it easily peels off the skin of perfectly round and bright citrus fruits, but also because the aroma literally induces excitement (hence the reason citrus scents show up in a ton of products)! I implore you to get one and find a reason to use it! As I was rolling the lemons around the zester, I noticed that despite my careful inspection of the fruit in the grocery store, they still had a few imperfections. I then began to think of how I’ve used this one fruit for so many things. Got a pimple? Use a lemon. Sore throat making you miserable? Use a lemon (in your tea). Getting ready for your spring cleaning? Use some lemons! Need a pick me up? Slice a lemon. The list goes on and on! I admire versatility in fruit…and people too of course. In this moment, I found myself thinking that lemons are a lot like people. In spite of our imperfections, we can still be used to do and become a host of great things. Our uniqueness is what keeps the universe energizing and delightful. In addition, we all have an opportunity to use our gifts to bear fruit in many areas of life. And despite our scars, we can still choose to be bright and refreshing in all that we do. The only things that should be losing their zest this week are the lemons for your marinade or cake or cleanser or…fill in the blank. Don’t let opposition or opinions dim your shine. So, be like a lemon — Stay vibrant. Be flexible. Embrace your cool. I like food. No, I take that back. I LOVE food! One of my favorite hobbies is trying new restaurants especially those that offer an eclectic cuisine. I do draw the line at some wild food delicacies though. I’m adventurous, but I don’t eat bugs! You can put all the chocolate sauce on a worm that you want, but it’s still a worm! My love of food is of course about the taste, but it’s also about the versatility of ingredients that can be used to make dishes. As I’ve matured, I’ve gained a new appreciation for food and what it means for my body. I think part of that is because I’m now the one buying the groceries and leaving the tips at restaurants. Your wallet has a way of making you see the light! But, I’m also fascinated by the multitude of fruits, vegetables, and herbs created for us to eat! It’s like a rainbow of yumminess. I go to Whole Foods sometimes to stare at all the colors in the produce section. 🙂 I’m much more mindful now of what I consume probably than I ever was before. In my efforts to enrich my life with those things that are motivating and wholesome, I’ve tried to translate that into the way I look at food. I buy and consume food with my future in mind. I love pizza, French fries, Doritos, and plenty of other not so healthy foods although my mom seems to think that carrots and hummus are always my preferred snack of choice. I’m come this far, but I’m not there yet! These days I’m making a conscious effort to live in a way that makes me feel whole, and part of that means I’ve been spending more time in the kitchen. I also allot time to search for recipes that incorporate whole foods. Dear God, thank you for the Pinterest founders a.k.a geniuses. By no means am I a gourmet chef, but I don’t let that stop me from trying to make meals at home. It’s crazy because cooking has never been one of those things I’ve liked to do or really felt I had the time to do. But, the less I’ve focused on the act of cooking and instead considered the benefits of making better food choices, the more therapeutic cooking has become for me. That may be attributed to the fact that my last few dishes have been superb, but either way I’ll take it! I know this is the age of the microwave and all things fast food. And truthfully, some days we don’t have the time to break out the cookbook and Calphalon. However, if we are to be the best version of ourselves, then we have to ensure we have the right fuel. We are not machines. When we treat our bodies like they are machines, then things typically start breaking down. And the older you get, the harder it is to bounce back. So, whether eating whole for you means one less bowl of ice cream or one more home cooked meal per week than usual, let that be the start of creating a life that’s full of what will help you think clearer, live longer, and look better. Here’s some inspiration from my kitchen! Have you ever had a situation where there was a decision to be made and you didn’t know how to make it? Have you needed an answer but didn’t even know how to ask for what you needed? What about trying to deal with the naysayers in a civilized, sophisticated fashion? How about that feeling when you’re tired of being tired? Or have you ever been so depleted where days were a blur but yet you still believed there were moves to be made? I’ll take my chances and assume that anyone reading this can identify with at least two of these, and it took you a few revolutions with the same type of circumstances for the lesson to click. There will be times when you have to push towards your aspirations and tasks in order to make the most of opportunities and blessings. But, there will also be moments when you’ll need to just stand. You’ll need to stand to hear, stand to recognize and receive your answer to a prayer, stand to perform a comprehensive reality check of what is and isn’t for you, stand to witness God work out situations you thought you knew how to handle, and stand to give your body and spirit an opportunity to refresh and revitalize everything from your cells to your ingenuity. I can admit standing is a challenge especially when you’re one part control freak and one part perfectionist. I’m both of those mixed with a few other obsessive and workaholic parts, so I have firsthand experience in knowing how difficult it is to stand. This also means that I can confirm that some of the solutions you’re seeking will come when you decide to do absolutely nothing! Are you still with me? *breathe* Yes, give yourself permission to do nothing! You’ll be surprised by the number of times along your journey when your job is to not have a job. Put yourself in a posture that demonstrates you’re strong in your faith and confident in your heart that making the choice to stand in the midst of life’s clamor is not a concession of failure but your personal consent to freedom. Last week was quite a treat. The buckets of snow that Mother Nature emptied in our backyards resulted in closures and/or delays for most schools, governments, and organizations just about every day of the week. I think the kids even had a few extra hours of shut eye this morning too, because my commute was way too light for there to have not been a 2-hour delay. No complaints from this gal! When the roads were finally clear enough for places to begin re-opening late last week, it felt as though everyone was in a rush. I’m still trying to discern whether people were desperately trying to escape another day in the house with their families or they just couldn’t wait to get back to their corporate tasks. The jury is still out. After navigating my way through the chaos of the Metro parking deck on Wednesday, I made my way into the wet and airy station hoping I wouldn’t have to stand outside for an unknown number of minutes waiting for a train to go downtown. As I was walking up, I noticed a lady carrying three bags and racing through the station. My immediate thought was why is she running when there are no trains to board and practically everyone has a delayed arrival. She wasn’t really getting too far with the weight of all of her tote bags dragging her down anyway. Within those couple moments of me watching and wondering, I was completely caught off guard as I saw her feet in the air and all the bags plopping on the ground one by one! Have you ever seen dominoes fall? Yikes! I quickly ran over to ask if she was okay and put my hand out to help her up off the ground. I really wanted to find her some Shout Wipes since she was now wearing the black gunk from the shoes of thousands who had trekked the melting snow and ice inside the station. The woeful look on her face let me know that she was probably more embarrassed than she was anything else since she had violated one of the fundamental rules for Metro riders on the move — wear rubber-soled shoes! Long after witnessing this lady’s unfortunate event, I couldn’t help but think of how burdensome it can be when you’re in a hurry. Living in the DMV area, you don’t really have to look far to see someone lost in the translation of their thoughts and trying not to spill Starbucks all while bobbing through briefcase toting crowds. Some days I’m personally overstimulated by the pace in which we all operate and have accepted as normal. I should acquire my country cottage very soon. I imagine the feeling is the same in any other large, metropolitan city across the nation. We’ve somehow normalized working late hours, running around town to meetings, and guzzling caffeine to keep us going, but yet we tend to vilify balance, time for reflective thinking, and time off (dare I say paid time off). I wonder how much that has stifled our creativity and effectiveness as a collective body and diminished our individual abilities to do more with less. I think this week we should take a moment to breathe and slowwwww down. I know it’s the first of the month and we’re one month into the new year, but life is not a race. Too often we think we’re outsmarting and outdoing those around us by being “first,” but instead we’re really cheating ourselves by rushing through life and chasing things that probably aren’t meant for us in the first place. We could all take a lesson from that lady I encountered in the Metro — sometimes you have to slow down and level your thoughts to avoid unnecessary falls. But, if for some reason you just can’t resist the urge to hurry to your next engagement, do make sure you have the proper footwear. If you reside on the east coast or have access to any major news outlet, then you’re fully aware that this side of the nation currently looks like Antarctica repositioned itself in the world. The monstrosity of snow all around is slightly unbearable. The first couple days in the house are always delightful because you get to rest, play, watch, eat, and repeat. Once you realize that a plow truck probably won’t make it to your neighborhood until next year (ok, perhaps a bit of an exaggeration), you suddenly develop a mild case of anxiety. Maybe this is just my personal experience (I’m okay with admitting it), but something tells me a few more are showing symptoms of cabin fever. Three things have gotten me through this snowstorm — the congenial company of my boyfriend, Wifi, and music. Had any of these been lacking, I’m convinced I would’ve put my clothes on backwards on multiple days instead of the one that I did (oh my…don’t judge me). But, the one outlet that has been particularly helpful is music. It’s one of the few things that can calm my spirit, minister to the fragmented pieces of my soul, and ignite a renewed sense of happiness. And sometimes when we need to dig out from the mounds of distractions and disappointments in our lives, music has a way of helping us breathe. Below are ten of the songs in my rotation that perhaps will regenerate a strong sense of tranquility and cheerfulness to carry you forth into whatever your journey may bring in the coming days. Hopefully, it won’t be another prodigious mass of snowflakes. Stay warm! But, more importantly, stay inspired!